Rick Remender will premiere Seven to Eternity from 5 to 8! Rick Remender returns to The Comic Bug! Come celebrate the release of SEVEN TO ETERNITY with this RARE APPREARANCE of one of comics' most exciting and critically-acclaimed writers! Rick will be signing copies of Seven to Eternity at our Manhattan Beach shop from 5:00 to 8:00 p.m. Don't miss out! Bestselling writer Rick Remender (BLACK SCIENCE, DEADLY CLASS, LOW, TOKYO GHOST), artist Jerome Opeña (Uncanny X-Force, Fear Agent), and colorist Matt Hollingsworth (TOKYO GHOST, WYTCHES) launch an all-new, jaw-dropping ongoing series in SEVEN TO ETERNITY this September. In SEVEN TO ETERNITY, The God of Whispers has spread an omnipresent paranoia to every corner of the kingdom of Zhal; his spies hide in every hall spreading mistrust and fear. Adam Osidis, a dying knight from a disgraced house, must choose between joining a hopeless band of magic users in their desperate bid to free their world of the evil God, or accepting his promise to give Adam everything his heart desires. 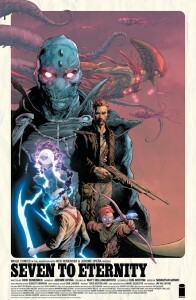 “Before our time at Marvel, Jerome and I began working together at Image ten years ago on titles such as Strange Girl and Fear Agent so it’s very fitting we return now to tell the tale of the Seven to Eternity,” said Remender. “All those years ago we began discussing doing an epic fantasy tale at some point, should the planets ever align. A unique take on the familiar genre full of action, unexpected twists, totally unique characters and a villain who might end up stealing the show. It’s taken us a decade to get it together, but the wait was worth it. During the past decade we’ve collaborated on numerous projects and fine-tuned our mighty nerd skills to a point where what we produce here will eclipse our past collaborations and consume all evil in the universe and give a new pony to every child. This is without question Jerome’s best work to date and when you add super champion of color jive Matt Hollingsworth, once their powers are mixed into the art cauldron, something new and terrifying is born, a new level of sequential science.” Opeña added: "It's been a long time coming, so it's amazing that Rick and I are seeing a project we've been developing for years finally become a reality. Having Matt Hollingsworth join up with us makes it even more exciting and I hope readers will enjoy what we've all been tirelessly working on." 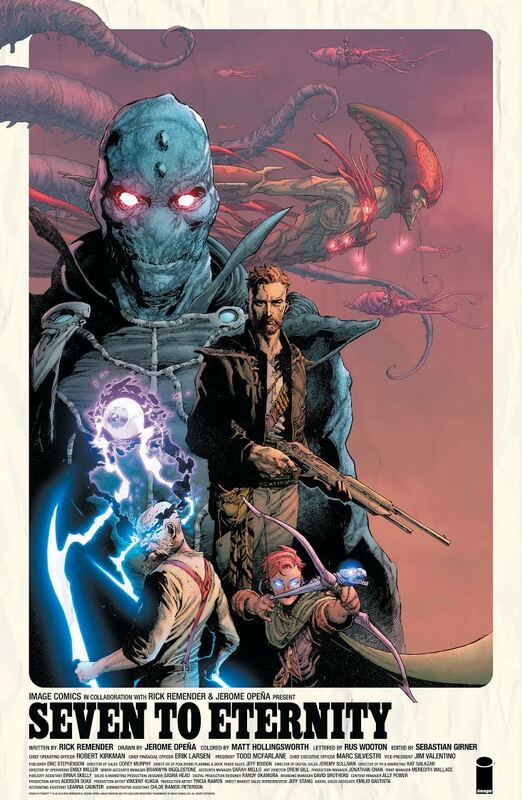 SEVEN TO ETERNITY takes readers on a hard road through the strange fantasy world of Zhal. All men have surrendered their freedom for fear. Now, one last free man must choose.